The informally-named Holuhraun volcano in Iceland now formally bears the same name, making fans of naming it after dragons, witches, or internet service providers sob furiously. Holuhraun is part of the Bárðarbunga volcanic field. A swarm of earthquakes in August 2014 triggered an increase in monitoring. The gentle fissure eruption was overall quite low-key, with no major consequences before coming to a complete stop. It is most notable for providing us with neat infrared images of volcano-spawned tornados, and for creating the largest lava field in Iceland since the 1783 Laki eruption. 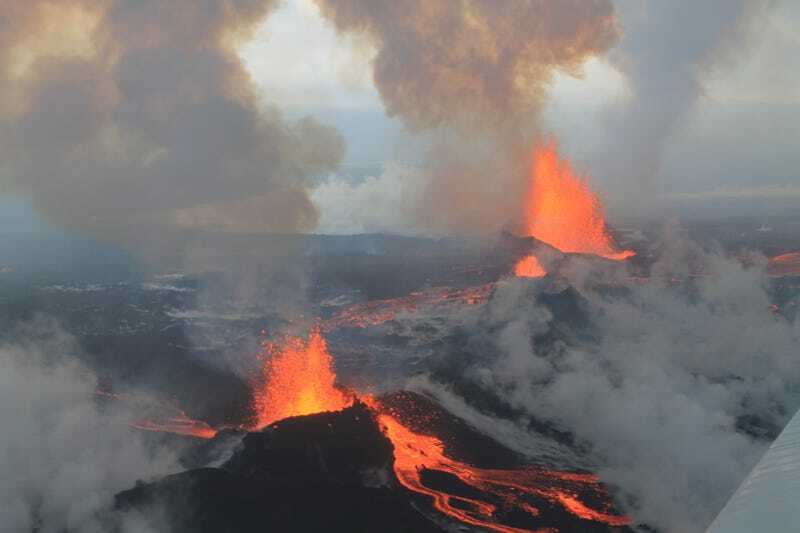 While Holuhraun is the name most commonly used in mass media, the Institute of Earth Sciences and Icelandic Met Office both used the name Nornahraun (“witch lava”) in some of their official messages starting in October 2014. In Iceland, only local municipalities can name new locations. Five counsellors represented the 371 residents of Skútustaðahreppur to pick the named, deciding between Flæðahraun, Holuhraun, Nornahraun and Urðarbruni. Nornahraun and Urðarbruni each earned one vote, while Holuhraun earned two. The fifth counsellor left before voting. The council still needs to name the caldera and any other new features created during the eruption.